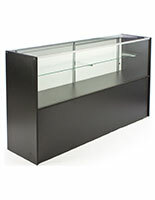 6' length allows users to purchase fewer display cases! Half-vision design features a hidden storage cabinet! 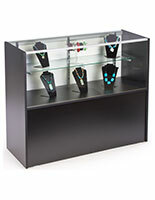 This glass display case adds functionality to your business environment. 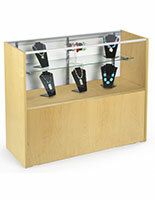 The store fixtures are ideal for retail, department or jewelry stores, souvenir shops, museums, boutiques and more. A glass display case, like this retail showcase, holds everything from cameras and electronics to makeup, jewelry, handbags, glassware, fine china, eyewear, or comic books. Business, university and theater lobbies are also common places to see these cabinets. 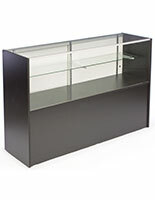 In these locations, glass display case fixtures hold corporate, performance or sports memorabilia, student artwork, awards, certificates, or trophies. 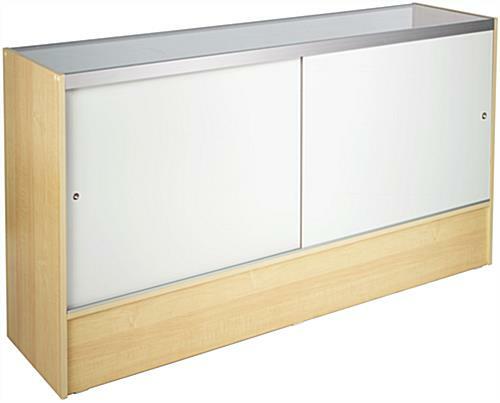 These versatile counter showcases offer a centralized area to both store and highlight best-selling merchandise in retail environments. Patrons or customers are attracted to glass display case contents, and will often inquire about the contents. Store associates then have an opportunity to upsell certain items. 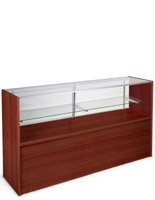 This store fixture, glass display case features a tempered glass and melamine construction. 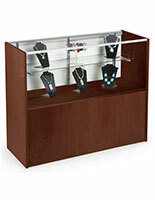 A sturdy, durable showcase that is much less likely to break than traditional cabinets is the result. 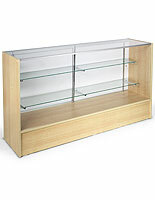 A full-length, height adjustable shelf offers displaying options within the glass display case. Shelving can be adjusted as necessary to accommodate changing or growing product lines. Sliding hardwood doors allow quick and easy access to glass display case contents. A small storage cabinet is located underneath the showcase area to hold cleaning supplies, excess inventory, or gift wrapping. This unit is sent unassembled to save on shipping costs, and to offer same-day shipping on orders placed before 1pm EST. Assembly is simple, and takes about 15 minutes with two persons. These cases are 6' long half-vision displays. 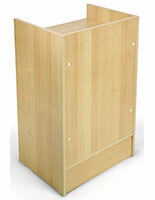 Related products include 4' and 5' length showcases, available in maple, black and cherry finishes. 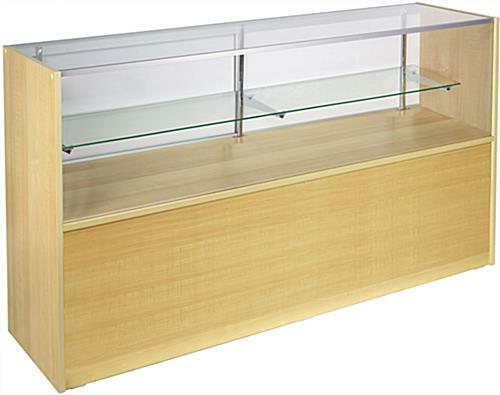 Store fixtures like these glass displays keep products safe and dust-free!